Opened on Indy&apos;s Southside May 29, 1995, The Training Station combines the bright, clean atmosphere of an expensive, modern health club with the back-to-basics intensity of an 80&apos;s hard-core gym. With over 20 years of weight training experience, owners Doug and Toni Walker have a vision to make The Training Station one of the leading serious weight lifting gyms in Indianapolis. 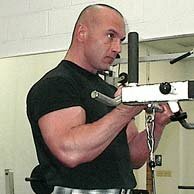 Stop by and check us out at http://www.thetrainingstationinc.com or e-mail us at doug@thetrainingstationinc.com. The Benefits Of Strength Training!